Finding new and innovative ways to improve your guest experience in always a high priority. How sweet would it be to offer a nostalgic treat which everyone is familiar with, but has never experienced quite like this? 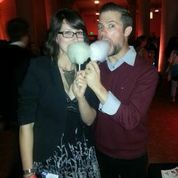 Our amazing All Natural Cotton Candy have been a hit with guests at Cirque du Soleil and at many innovative venues where our unique treats are offered. Our cutting-edge flavors are found nowhere else in the world and made entirely out of organic and all natural ingredients. Additionally, Our Atlanta-based innovations team has the ability to create any new flavor to meet your specific demographic needs. With so many flavors to choose from, making a decision is not easy! Let us help. If you’d like to taste any of our offerings, email us at info@cottoncravings.com! Next Next post: Where Can I Buy a Cotton Candy Machine Like That?